To hold the iPad with its 9.56 inches height, the LUXA2 H4 holder comes with dimension of 20cm height and 22cm width, 6 supporting arms with rubber pins hold eReaders tight and secure. In order to enjoy all the functions of the iPad and other modern eReaders you frequently want to have your hands free, so you don’t need to joggle the device around while trying to operate it. 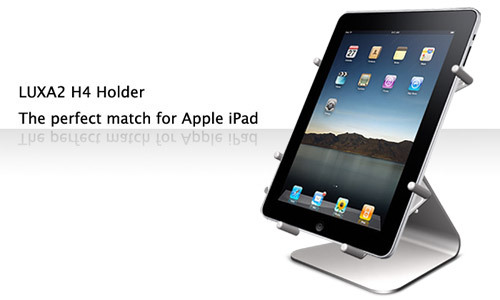 Protecting your new iPad/Kindle or any other eReader is important, the newly released LUXA2 H4 Holder, with durable aluminum and a rotatable pivot which allows you to turn and flip your iPad freely, and have it always in a perfectly stable and ideal viewing angle. The stylish LUXA2 H4 Holder is tailor-made for the iPad and other upcoming e-Book tablets and further increases enjoyment as it is beautifully crafted with brushed finish process to ensure the simplicity and stylishness. With the silicone pad design, which is made to have a smooth and flat surface for adhering to the flat surface of the supporting object, the LUXA2 H4 holder can hold the iPad and any other e-Books on the market safely. The LUXA2 H4 Holder is the most convenient hands-free solution for Apple iPad, making it an even more pleasurable entertainment enjoyment. Uniquely you.